Protesters lead a group and chant at the third-annual Women's March on Saturday. Thousands of protesters gathered in Freedom Plaza Saturday for the annual Women’s March. The march route passed in front of the Trump International Hotel and protestors chanted “shame” as they passed the heavily-guarded building. 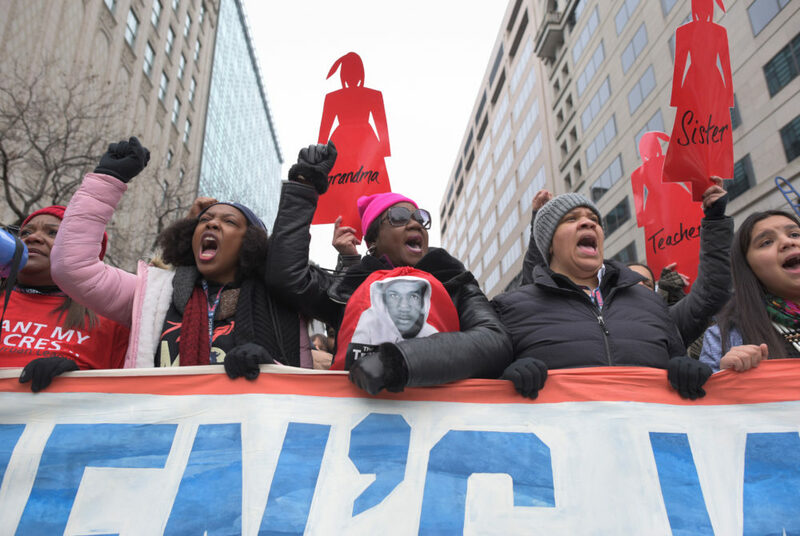 Once marchers reached their destination in Freedom Plaza, speakers at the rally discussed the importance of diversity, inclusion and intersectionality in the women’s rights movement. 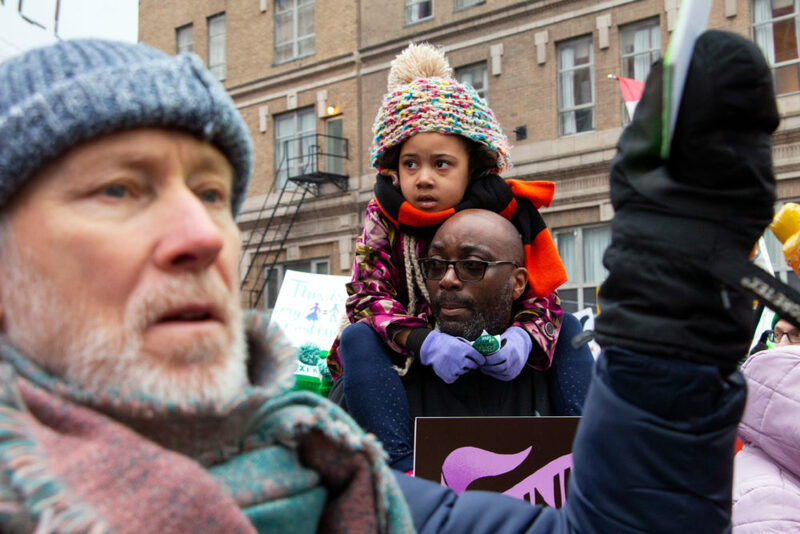 Bob Bland, a co-president of the 2019 Women’s March, said privileged groups must listen and learn from the experiences of women of color and be better allies. Bob Bland, one of the founders of the Women’s March, speaks to the crowd in Freedom Plaza after the march. 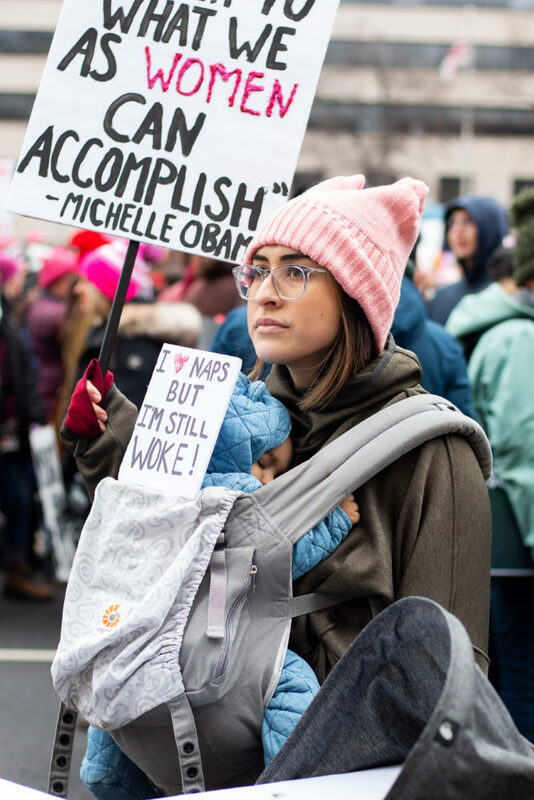 Nearly half a million protesters packed the streets surrounding the National Mall in the event’s first year and about a year later, thousands of protesters and prominent political figures returned to speak out in support of women. This year’s march took place under the shadow of controversy as some former supporters of the march accused its leaders of anti-Semitism. The GW College Democrats and GW Feminist Student Union condemned organizers of the march for tolerating hateful speech and vowed not to send a group from their organization. Carmen Perez, a board member for the 2019 Women’s March, said during the rally that she and other leaders do not condone bigotry under any circumstances. “Over the last year, my sisters and I in the Women’s March have faced accusations that have hurt my soul,” she said. “Charges of anti-Semitism and neglecting our LGBTQI family. 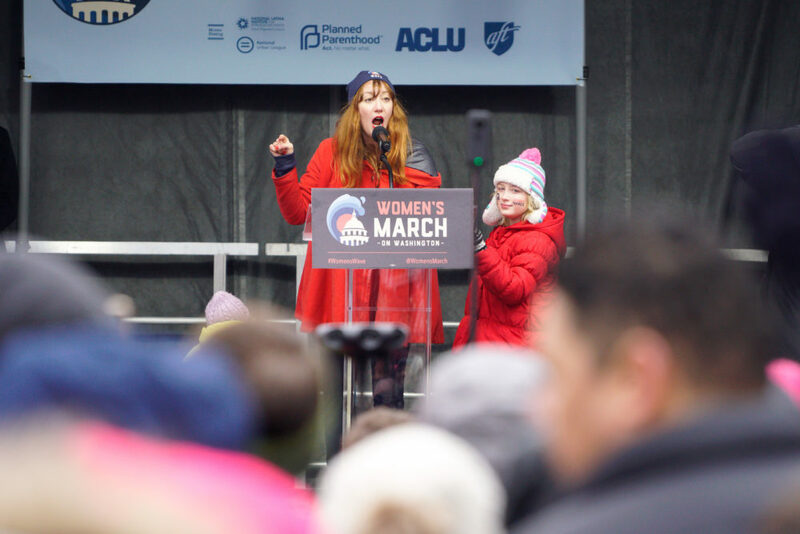 I want to be unequivocal in affirming that I and my sisters in Women’s March condemn anti-Semitism, and homophobia, and transphobia in all forms,” she said. A young protester sits on a man’s shoulders as they march with thousands of others during the Women’s March Saturday. But while some student organizations chose to sit out this year, others participated. March On the Campus created a Facebook event for students to attend the demonstration together. The group – which is affiliated with March On, a nonprofit organization that rose from the 2017 Women’s Marches across the nation – held a meeting Wednesday to discuss the allegations, according to the Facebook event. Cecilia Afre, a resident of Richmond, Va., holds up her sign as the third annual Women’s March begins behind her. Freshman Bekah Redwine, who attended the march with March On the Campus, held a sign that read “ERA means equal pay” and said she attended a march in Boston in 2017, but Saturday was the first time she attended the Women’s March in D.C.
Redwine, who is Jewish, said she did some research about the controversy surrounding the march’s organizers before ultimately deciding to attend. Manasa Karthikeyan, a freshman who attended the march, said she wanted to show support for the fight for sustainability, abortion rights and inclusivity. She said she hopes political leaders will enact change after seeing the march. 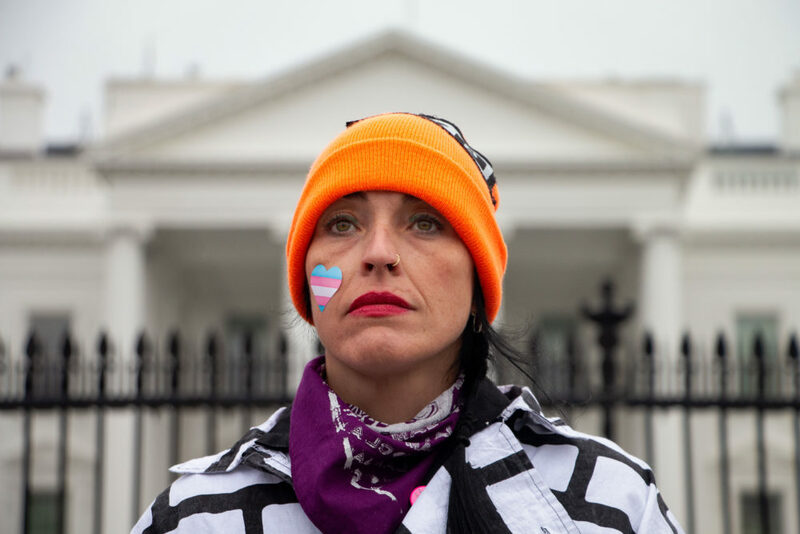 A member of Brick X Brick stands in silence in front of the White House during a demonstration at the Women’s March Saturday afternoon. The organization demonstrates by making “humans ‘walls’ against misogyny,” according to its website. While the speakers at the march’s rally emphasized national issues like immigration and criminal justice reform, the D.C. event also had individuals speaking out about local issues, like pleas for statehood. April Goggans, an organizer with Black Lives Matter D.C., urged marchers to call their representatives in Congress to back a bill that would make D.C. a state if passed. Goggans and fellow Black Lives Matter D.C. activist Dornethia Taylor also said the city’s “police occupation problem” and the absence of maternity care in the predominantly black wards east of the Anacostia River disproportionately hurt the city’s black women.